Johnny Sketch & The Dirty Notes will perform their unique blend on funk-rock as part of Arts at the Rives Theatre’ s Summer Series at Shining Star Farm on August 25, 2012. 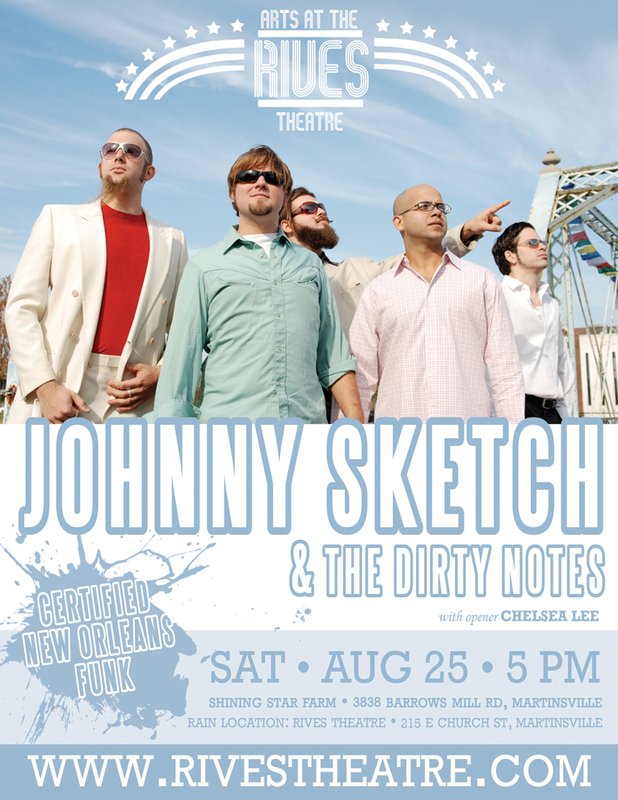 Since its inception in 2001, Johnny Sketch & The Dirty Notes (JSDN) has gained a loyal following in a competitive New Orleans music scene. Their style blends a hard driving rhythm section reminiscent of the Radiators’ swamp funk added to the punchy horns of Tower Of Power. In essence, JSDN is a classically trained tight unit. All of the members studied music in college, but a night with JSDN is very different than a night at the symphony. They combine the manic energy of 1980s Fishbone with Deep South soul. It is this energy that fuels the crowd into an enthusiastic frenzy, and the band has been known to jump into that frenzy head first (sometimes literally). It did not take long for these young musicians to land slots in most of New Orleans’ prominent live music clubs such as The Maple Leaf, Tipitina’s, The Howlin’ Wolf, The Mermaid, and The House of Blues. On the strength of those performances, JSDN was added to the rosters of many notable festivals and special events. JSDN’s debut album, Bandicoot was voted by Offbeat Magazine as 2003 Best Rock Album by a Louisiana Artist. This award was a flattering follow up to winning the 2002 Best of the Beat Award for Best Emerging Roots Rock Band. JSDN was also voted Best Rock Band in 2003 for The Big Easy Entertainment Awards. which they were nominated for again in 2004. Winner of Best of the Beat 2004 emerging Funk/R&B/Soul artist. Tickets to JSDN’s Summer Series performance are $10 and can be purchased prior to the show at Studio 107 and Woodall’s Music or at the gate on the night of the show.